Route and secure the data cables down through the bottom of the server. Cut a hole in the floor to route the power cords and data cables. For dimensions, see Mounting Holes and Cable Routing Floor Cutout Specifications. Stabilized the server to the installation site – see Stabilizing the Server. 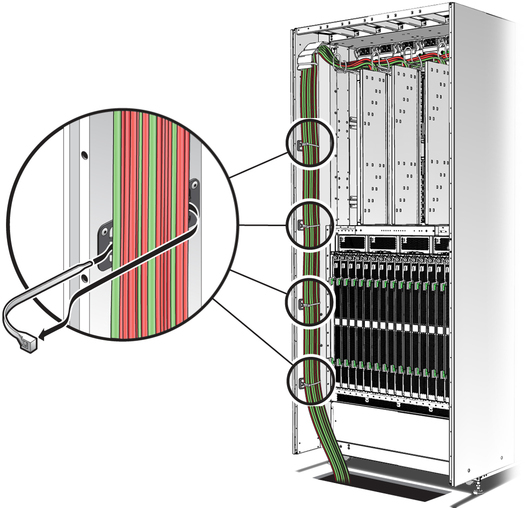 Review the server cable management devices – see Cable Management Devices. Confirm that the left cable bracket is installed – see Prepare the Cable Routing Brackets. Route the data cables up the server to the cable hooks located above the IOUs. Lead the data cables to the left cable bracket and then down the left cable channel and down through the bottom of the server. Using tie-wraps, secure the data cables to the cable hooks and to the left cable bracket. Using tie-wraps, secure the data cables to the left cable channel stand-offs. In the crawl space under the server, secure the data cables to your facility cable management devices. Request instructions from your facility manager.